"To ensure no child goes without the magic of the holidays, the Kellogg’s Rice Krispies #TreatsForToys program has once again partnered with The Salvation Army to encourage Canadian families to create a toy-shaped Rice Krispies treat and submit a photo on TreatsforToys.ca or share it in social media using the hashtag #TreatsforToys. This year, we’ve added a fun and creative new challenge: incorporate a moving part into your toy-shaped treat! But if that’s too much for your budding designer, a regular toy-shaped treat will work too." If you decide to participate, I would love if you would share the photo on the Tales of Mommyhood facebook page so I can see your submissions! 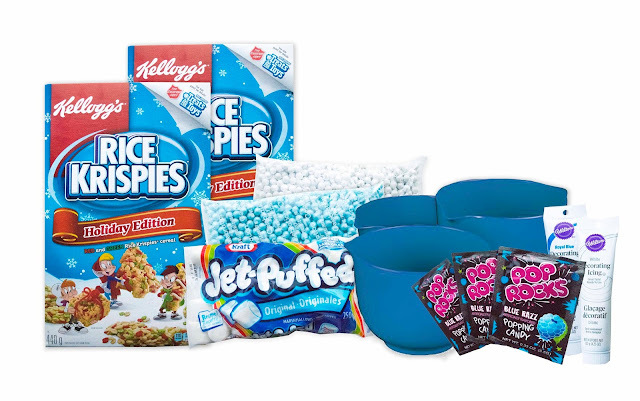 Kellogg's wants to see your Treats for Toys submissions, and is giving you the chance to WIN a prize pack to create your very own Toy Treats! For your chance to win, fill out the form below. This giveaway is open to Canadian residents who are 18+, and will end on December 5th 2017 at 1159pm EST. Mandatory entries must be completed or all other entries will be void. Good luck! I think we are going to make Christmas Trees, candy canes and maybe some bells!! I would like to make a sleigh and then put candies into the sleigh part. We would make the Christmas Trees! We would make a train engine. little snowmen, or little wrapped gifts ! My kids would probably make Lego bricks! I think they would most enjoy building a robot. We would make a doll, or maybe I could convince them to try an animal. My daughter would like to make snowmen, I think. I would enjoy making a teddy bear. Christmas trees and snowmen would be a lot of fun! My kids and I would enjoy making a robot. I know my boys would want to make the Robot! Thanks! a train would be fun to attempt. We would enjoy making a train. A dinosaur for sure and likely some contraption to keep him in. My son would want to make a dinosaur! I think Miss R would love trying to make a train. The kids like making cars with the squares. I think my guy would want to make a dinosaur! I think Sophie would enjoy making a cat. not sure what toy my daughter would want to make but I am sure emoji's are in thre somewhere. We would be making little Lego people. We would enjoy making a robot. I think my kids would make a ball lol. My daughter would enjoy making either a snowman or a robot! My girls want to make Olaf & other snowmen! I think a train would be a favourite. My sons would want to make a dinosaur! We would love to make the robot!